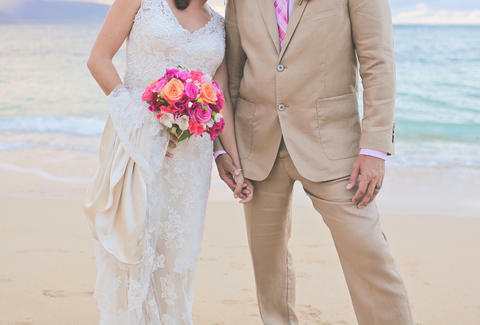 This Couple's Having 38 Destination Weddings Because... Why Not? A destination wedding's a surefire way to piss off your guests and get you trending under the hashtag #WhoDoYouThinkYouAre. You're lucky if guests stop shy of writing in "Hell" next to the "No" checkbox. But one couple took the idea that the nuptials are all about them to the next level, planning not one... not two... not even three... but 38 DESTINATION WEDDINGS. Suffice it to say, Cheetah Platt and bride Rhiann Woodyard (these are real names) won't have to deal with weird uncles and/or awkward first dances. No, in a feat of indecisiveness, this couple has planned 38 ceremonies on six continents. Because nothing says, “I do,” like hitting those credit card travel miles. According to BuzzFeed, what started as a wedding theme conundrum ended in three months of traveling the world together, getting married at one exotic location after another. Oh, and the lovebirds are also acrobats. If the concept of three dozen weddings in Egypt, Morocco, and Colombia wasn't strange enough, add in a solid dose of gymnastic-themed selfies. The couple will eventually return to the US to tour national parks and do the more traditional thing with their families -- whatever that means for acrobats. Until then, you can keep up with their love-filled journey by following the groom @CheetahPlatt.